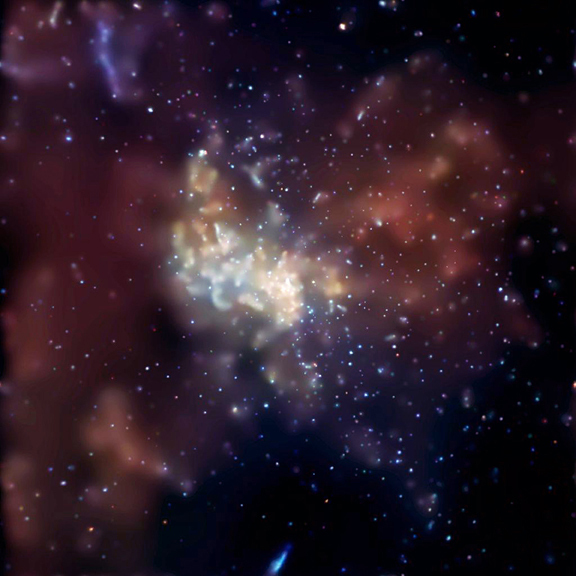 The center of our galaxy, including the supermassive black hole Sagittarius A*, as viewed in the X-ray with the Chandra space telescope (Baganoff et al., CXC, NASA). Current observations indicate that roughly 80% of the matter in the Universe is in the form of “dark matter,” i.e. matter that does not emit nor absorb light and thus appears to be invisible. We have deduced this in several ways via its gravitational influence, the first being in 1932 when Oort explained the orbits of stars in the Milky Way and in 1933 when Zwicky explained the orbits of galaxies in clusters. We have also mapped out the large-scale dark matter distribution from its weak gravitational lensing signal. Given all of the evidence we have so far, the best particle physics model we have is that dark matter is in the form of Weakly Interacting Massive Particles (WIMPs). These particles are expected to annihilate with each other, with the annihilation rate increasing with the dark matter density. This means that as a gravitationally collapsing cloud of WIMP dark matter grows denser, the particles will increasingly interact with each other in a way that decreases the total particle number and releases the energy in a different form (such as photons). In other words, as a cloud of dark matter collapses, the particles fizzle away. This annihilation process becomes very important to the formation of black holes — objects so dense that not even light can escape their gravitational pull. In order to form a black hole, a collapsing cloud of dark matter has to attain a critical density; however, the denser the cloud becomes, the faster the matter fizzles away due to annihilation. Which comes first, black hole formation or complete annihilation? In order to answer this question, I wrote a simulation of the formation of dark matter black holes in C. This involved using a realistic model for the initial conditions and then solving the hydrodynamic and annihilation equations at each time step with a fourth order Runge-Kutta integration scheme. The main result was the discovery of a critical mass scale for black hole formation, interestingly equal to the scale of supermassive black holes that reside at the centers of galaxies. We also computed the expected energy release from annihilation during collapse. Vanderveld and Wasserman (2005). Published in the Journal of Cosmology and Astroparticle Physics.